Last week, Dennis Kucinich seized headlines by traveling to Syria and expressing some degree of sympathy for the Assad regime. What Kucinich actually said to the Syrian media is now under some dispute, but there can be no doubt that the congressman’s views on the recent violence in Syria lack moral clarity, to put it mildly: Back in May, he told The Plain Dealer of Cleveland, “There’s very serious questions raised about the conduct of the Syrian police, but we also know the Syrian police were fired upon and that many police were murdered.” In other words, the Syrian regime might be doing bad things, but so is the opposition. Kucinich is not the only observer to have implied that we ought to be skeptical about the Syrian protesters. Some experts have hinted that the protesters are motivated by Sunni supremacism, since Syria is 74 percent Sunni and 14 percent Alawite, the Shia sect to which the Assad family belongs. In light of these assessments, it’s worth pausing to ask: Who are the Syrian protesters? And are they actually as dangerous as the Assad regime itself? That last clause was calculated. At the start of the Syrian protests, Assad tried to draw parallels with the 1982 Muslim Brotherhood uprising—brutally suppressed by his father, Hafez al-Assad—and depict the current unrest as a “Salafist” or Sunni terrorist insurgency (when not one coordinated by the Mossad or other “foreign infiltrators,” as he originally maintained). The statement by the LCCs was a direct rebuttal to the claim that the opposition was driven by sectarianism. There have been indications that the protesters are living up to this ideal. On day three of the uprising, in the Umayyad Mosque in Damascus, a roaring crowd held aloft one protester brandishing a sign with a crescent and a cross, and Arabic script beneath which read: “Yes to freedom, no to oppression.” Elsewhere, Christian clerics have prevailed upon their congregations to support the revolution. And a Damascene freelance journalist I spoke to recently told me of how Alawites in Lattakia had been sheltering Sunni university students whose dormitories had been raided by the shabbiha, or roving death squads loyal to the regime. 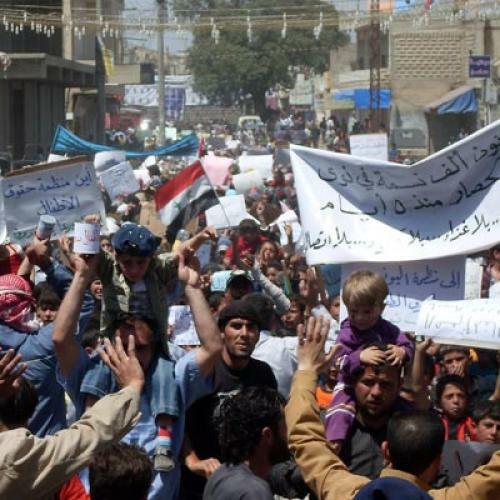 Indeed, one protester on the ground in Homs with whom I communicated via a Beirut-based intermediary said: “We will never stop, Druze, Sunni, Alawite, and Kurd, we will never stop.” Protests in Jableh and Hama have seen Sunnis and Alawites marching side by side against the regime. To be sure, the information we have about the Syrian protesters is both anecdotal and incomplete. Moreover, opposition movements often devour themselves quickly or abandon their ideals once they become successful. And there are certainly Islamist elements associated with the Syrian uprising. But while the opposition may not be perfect, it would also be absurd to think that it is no better than the Assad regime. With rare exception, the information coming out of Syria confirms that the moral equivalence of Kucinich is not rooted in reality. In Syria, we should not hesitate to side with the opposition. Michael Weiss is communications director for the Henry Jackson Society, a London-based think tank that promotes democracy and human rights abroad.